Special to the DailyA snowboarder manuevers through the fresh powder at Copper Mountain on closing day. Breckenridge Ski Resort and Copper Mountain closed out the season Sunday on the heels of one of the strongest snowstorms of the year. A short-lived system brought a reported 12 inches to Breckenridge overnight Saturday and 13 to Copper, softening up the slopes for the last runs of the year for hundreds of skiers and snowboarders. Temperatures plummeted from the mid-40s last week back into the 20s on Sunday, keeping the fresh powder light and loose for the final turns of the season. At both resorts, skiers and snowboarders could be heard cheering in the trees and across slopes as they enjoyed the kind of snow that would be celebrated in January. Copper got just over 40 inches of fresh snow in April alone, rivaling the now legendary snowfall seen at the end of the 2010/2011 season. 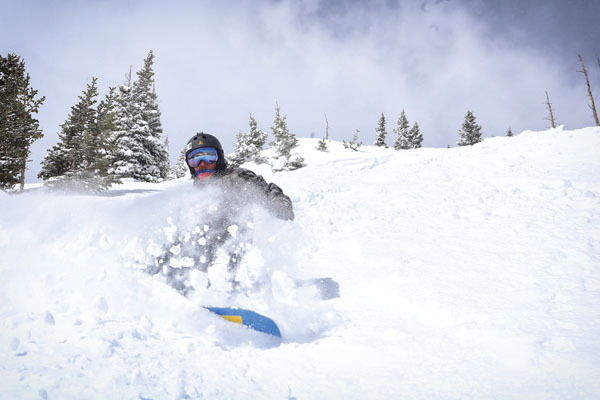 Breckenridge received 26 inches of new snow in April prior to Saturday’s storm. Both resorts celebrated closing weekend with concerts and festivities. Copper marked the occasion with the Redbull Supersoakers competition, the CopperMan Winter Adventure Race and live music by Matt and Kim and Domestic Problems. Hundreds turned out to see Matisyahu and 3Oh!3 play at the base of Peak 8 Saturday and Sunday, winding down four weeks of concerts and festivities along with the season. The snow is expected to continue for the next several days, helping to sustain conditions at Arapahoe Basin Ski Area, which has set closing for June 2. Forecasts call for an additional 3-5 inches of snow today, 2-4 inches overnight and 2-4 inches Tuesday, with snow possible Wednesday and Thursday as well. For some, the timing of the storms is bittersweet.